James Chambers is Rothwell's dangerman. Oundle host Rothwell in the quarter-finals of the Northants Twenty/20 Cup at Milton Road tonight (June 30, 6pm). 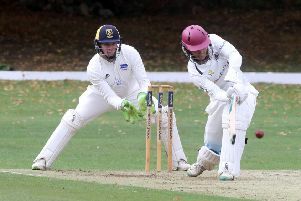 The Northants Premier Division side should be too strong for opponents who currently sit mid-table in Division Two, but they will be wary of former player James Chambers. Big-hitting Chambers is playing for Rothwell as a professional this season and he’s already passed 500 Division Two runs at an average in excess of 70. However, while Oundle were pushing top-flight leaders Rushden all the way on Saturday (June 27), Rothwell were losing to Horton House seconds. Horton firsts are bottom of the Premier Division. The winners will compete in Finals Day at the Northants County Ground later this month. Holders Peterborough Town were beaten by Rushton in the second round. Other quarter-final ties: Finedon v Old Northamptonians, Horton House v Rushton, East Haddon v Stony Stratford.